Here at Magnolia we are prepping for the colder months ahead of us so you, too, can be ready! Make sure your closets are full of the coziest and trendiest items to wear all season long. We want to share some trends we are loving for the fall/winter months so you can look great at any occasion! Go ahead, click the picture, and it will lead you straight to the product on our site for purchase! there is no surprise it's at the top of the list for favorite trends this year. stay cozy and cute all season long. have all your needs in chunky sweaters and cardigans this season to warm up on a chilly day. We especially love thick cable knits! What better way to make your wardrobe even cuter than by adding an adorable sleeve? detailed items from ruffles, lace, buttons, and more! to the next level and is basically a built in scarf… what’s not to love? 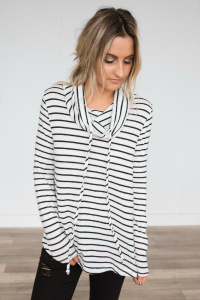 Plenty of our tops have this cute neckline, so there is something for everyone! cardigan is yet another way to stand out from the crowd. They add an interesting flare to even a basic top. Stock up now! What are some of your favorite chilly weather trends?